The hospitality industry once again stepped up in support of Team Margot at the Publican Awards last night in London. 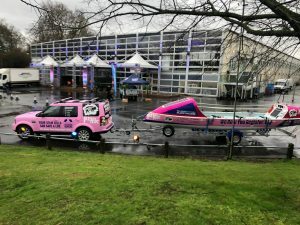 Team Margot Atlantic Rowers were represented at the awards by charity trustee, James Cuthbertson and the 1,400 industry attendees were encouraged by The Publican Awards to support a new initiative: ‘Pinkspiration Week’ from 23 – 30 July 2019, as part of an awareness raising effort to get 1.5 million people in the UK to join the stem cell register. Thank you to all involved with this fantastic effort. We very much look forward to working with many pubs & bars, restaurants and hotels to make this initiative a success. And we hope that other industries will throw their support behind this too. ‘Pinkspiration Week’ – what’s it all about? This December, the Team Margot Atlantic Rowers, a team of four dads, will be rowing across the Atlantic in the Talisker Whisky Atlantic Challenge, with the aim of signing up 1.5 million people to the blood stem cell register. This number is being targeted as it will take the team around 1.5 million strokes to complete this arduous 3,000 mile challenge, which will see the team spend around 40 days at sea. If they succeed in reaching this sign up target then statistically up to 15,000 lives could potentially be saved. The team have taken on this challenge as research by the international donor centre DKMS says there are currently over 37,000 people worldwide, particularly those from mixed heritage backgrounds, in desperate need of a stem cell or bone marrow transplant (including 2,000 in the UK). The Team Margot Foundation was set up in 2015 in memory of industry entrepreneur Yaser Martini’s daughter Margot and to honour her legacy after she lost her battle with blood cancer, aged two. One of the ways Margot might have been saved was through a well-matched stem cell donation from an unrelated donor on a register. Think Pink: Get Involved with ‘Pinkspiration Week’ now! 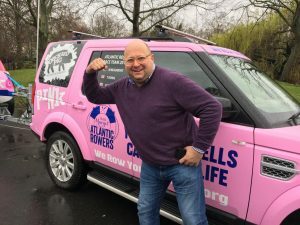 To help support the Team Margot Atlantic Rowers’ drive for 1.5 million blood stem cell registrations an awareness initiative ‘Pinkspiration Week’ has been launched. Taking place this July, hospitality operators are invited to get involved in the week to help raise awareness of the campaign and encourage sign ups from their customers. Hospitality businesses aren’t being asked to raise money, just to help raise awareness during the week by embracing the Team Margot colour pink in their sites for just a day or the full week. Ideas for activity for the pink theme week include featuring a pink drinks list, having a ‘Drink Pink Day’, offering pink-inspired dishes or teams wearing pink. Beds and Bars is among operators already taking part in ‘Pinkspiration Week’, which is also being supported by UKHospitality.